Bulgaria's capital, Sofia is a capital city on a human scale with a population of 1.3 million. It is in the top 10 best places for business start-ups in the world and is one of Europe's most affordable cost-of-living capitals. The National Palace of Culture (http://www.ndk.bg/) (abbrev. as NDK), in the heart of Sofia, is the largest multifunctional conference and exhibition centre in Southeastern Europe. It was opened in 1981 in celebration of Bulgaria's 1300th anniversary. NDK hosts over 300 events per year with 1 million guests. It is decorated with 80 monumental works of art implicated into the halls and foyers. It occupies an area of 123,000 m2 on eight floors and three underground levels. The CHEP 2018 conference will take place in NDK and the PyHEP pre-conference workshop - at the Hilton Hotel across the street. 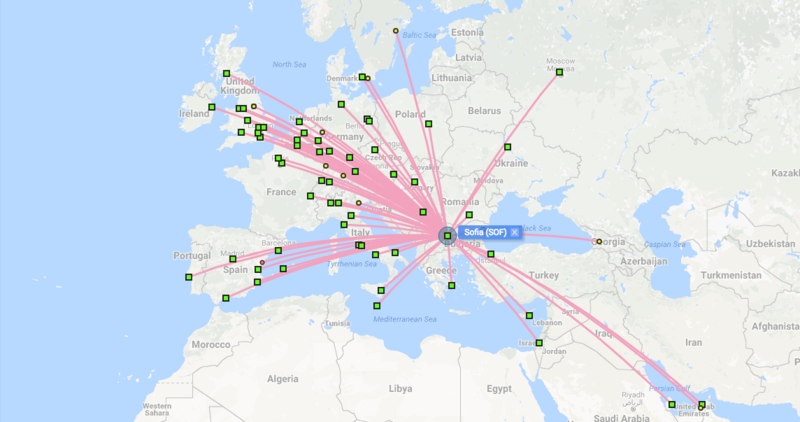 The airport is 9km away from the city center and the following cities are connected with direct flights: Athens, Moscow, Berlin, Paris, Belgrade, Rome, Vienna, London, Kiev, Tel Aviv, Dubai, Warsaw, Frankfurt, Munich, Doha, Zürich, Bucharest, Istanbul, Barcelona. Wizz Air (to/from Alicante, Barcelona, Bari, Basel/Mulhouse, Beauvais, Bergamo, Birmingham, Bologna, Bristol, Budapest, Charleroi, Catania (begins 26 March 2017), Cologne/Bonn, Copenhagen, Doncaster/Sheffield, Dortmund, Dubai-Al Maktoum, Eindhoven, Geneva, Hahn, Kutaisi, Larnaca, London-Luton, Madrid, Malmö, Malta, Memmingen, Naples, Nuremberg, Rome-Fiumicino, Tel Aviv-Ben Gurion, Valencia, Varna (resumes 26 March 2017)). Bulgaria is not yet part of the eurozone and many places work with the local Bulgarian currency lev/leva. The conversion rate to the EUR is fixed and 1 EUR is roughly 2 leva. While in many places you can pay with a credit card, it is very handy to have some amount of local currency. Banks and ATMs can be found at both terminals. Read more. Sofia Airport metro station of M2 is next to the building of Terminal 2 of the airport. The metro trains operate from 5am to midnight. See detailed schedule. Single ride ticket price is 1.60 levs (0.82 EUR). The ticket is valid for the entire metro network so you can use the same ticket for transfer to M1. Tickets can be purchased from the cashier desks in the metro station or from ticket machines. See information about different ticket options. 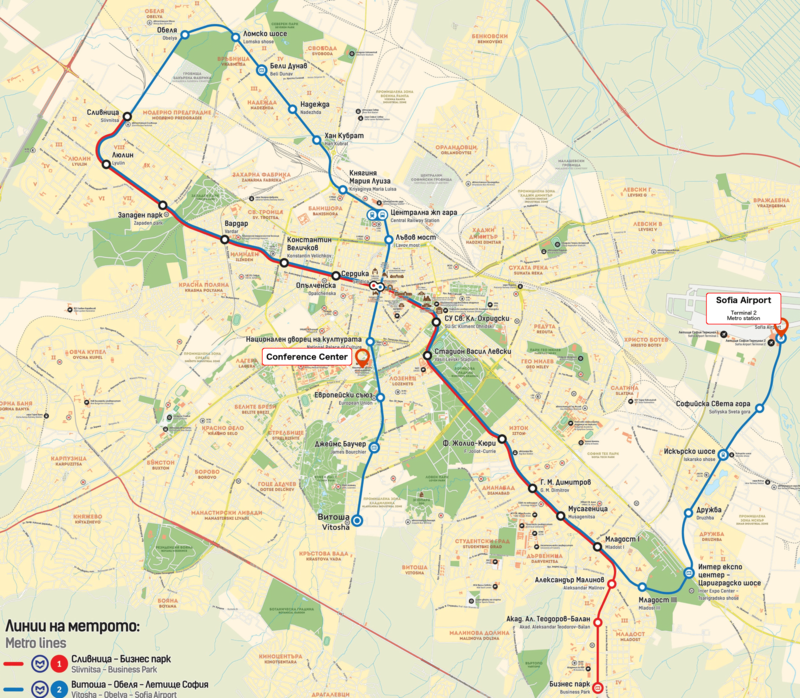 In order to get to NDK you should take metro line M2 and on station "Serdika" you should switch again to metro line M2 towards station "National Palace of Culture (NDK)" taking that way a shortcut instead of continuing to travel and visiting all the other stations. Sofia Metro Line 2 (Blue) operates service to the airport between 5:30 and 24:00. The stop is located in the eastern part of Terminal 2. The journey to the city centre takes 20-30 minutes. The journey to the central bus station takes approximately 30 minutes and a transfer is required. A single ticket costs 1.60 leva. You do not need new ticket when making the transfer from one metro line to another. Public Bus #84 operates service between both terminals and the city centre. The journey takes 30-40 minutes. Tickets can be purchased from news stands or ticket machines in the airport. A single ticket costs 1.60 leva. If you are traveling with luggage bigger than 60х40х40, you will need to punch an additional ticket for each item or possibly pay a fine of 20 lev. Make sure to have a ticket with you and validated it after boarding because this bus is the one that inspectors love to check the most (because of the highest rate of fines). The bus makes a stop at Orlov Most (Sofia University metro station), where you can transfer to the metro. There is another bus #384 which also stops there but it DOES NOT go to the city center. Since July 2015 there are coloured paths (Terminal 2) to the different types of transport. An yellow one will lead you to the taxi stand, a blue one will guide you to the metro station and a red one is for the bus station. Important tourist Information could be found on Wikitravel, LonelyPlanet, TripAdvisor.